Kyle and Marissa Vaner Borght knew they wanted something more than the life they were living in Burbank, California. Their day to day lives lead them down the black pavement to work then home again. Their kids played on pavement at the school they attended and played basketball on pavement in front of their house. Pavement, a modern day convenience, seemed to surround them, and at times felt suffocating, so much so that they knew it was time for a change. They began looking for a new place to call home. A new way of life, of living, of breathing; a place without pavement. Both Kyle and Marissa grew up going camping with their families. They wanted to create some of those same memories with their two boys, only they knew they wanted even more. “We knew we wanted something we could do together and be successful at,” said Kyle. For two years they searched for the ideal location and way of life. They looked in Oregon, in Montana, and in Idaho, then, finally found it in Stevenson, Washington at Timberlake Campground, just 10 minutes from the massive Columbia River. Timberlake Campground was created by LeRoy Anderson and opened in 2005. Kyle and Marissa purchased the 22 acre park in February of this year and could not be happier about their unique change in lifestyle. Being an hour away from the nearest Nordstrom doesn’t seem to faze Marissa in the least; she is thriving under the canopy of green leaves. There are 43 RV spots, a group RV spot and 22 Tent sites. It is quiet, family friendly and smack dab in the middle of the Columbia River Gorge. Close by, visitors will find the mouth of Wind River as well as Dog Mountain, a popular hiking area. 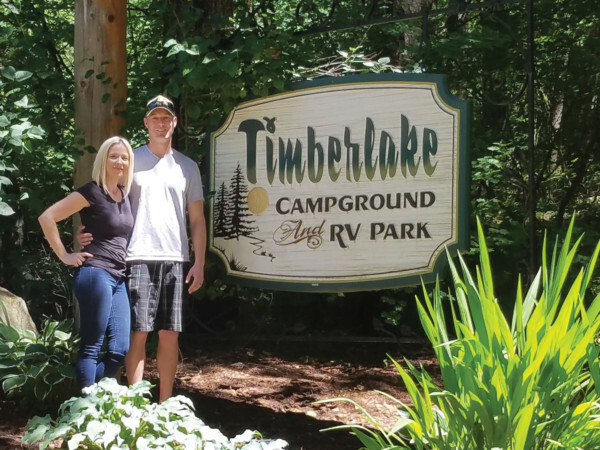 With plenty of room to stretch out in your own campsite, or stretch your legs as you stroll around camp, Timberlake Campground offers the kind of vacation camping enthusiasts are looking for. Walking paths tucked neatly beneath the multi shades of greenery bring a real sense of leaving the city behind. Far from the noise of train whistles that can accompany many nights stay in the gorge, Timberlake gives visitors a peaceful nights rest. Of course if it is a meeting place you are looking for, you will find plenty of room at the lodge at Timberlake Campground. With room for 100 and all the chairs and tables you would need the lodge can accommodate graduations, reunions, weddings and more. The commercial kitchen is an added bonus, as is the huge rock fireplace inside the lodge. The only thing missing from Timberlake Campground is, well, the lake. Although the campground is host to many fishermen throughout the year, there is not a lake for them to fish in at the campground. Luckily the Columbia River is just a short drive away. Kyle and Marissa are also host to several events throughout the year including their Wine & Cheese Tasting Weekend in May, Brew Fest Weekend in June, and two Customer Appreciation Weekends in October. Of course don’t forget to look for “Timber” the resident camp cat during your stay. Timberlake Campground is open from March 1 – October 31.